Following the closure of polling stations and the counting of votes, the Federal Government releases the result of the Election of the Prime Minister. Receiving 54,5% of the votes, the Pavlovian nobleman, former Prime Minister and MP Denis Tezdzhan was elected the Prime Minister of the Federal Republic. His rival Omar Cisneros finished the race second, having received 18,2% of the votes. 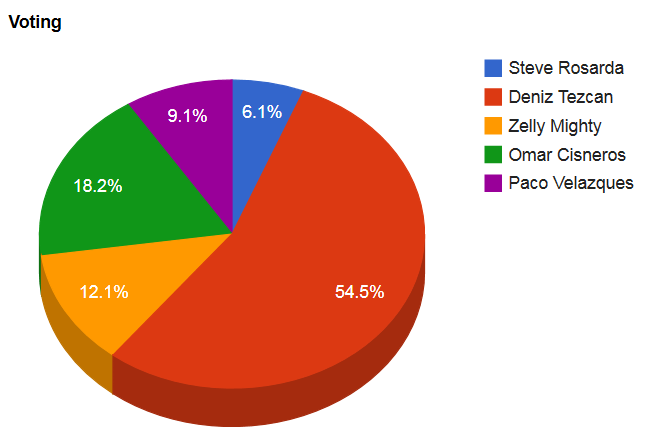 A Nigerian diplomat Zelly Chidy Mighty received 12,1% of the votes, finishing third; he is followed by Paco Velazquez with 9,1% votes and by Steven Rosarda, former speaker of the Grand National Assembly, with 6,1%. The election saw the participation rate of 45,8%. His Excellency the Prime Minister Elect already was congratulated by the Life President and is expected to deliver an address to the nation soon, in which he will announce his choice for Deputy Prime Minister. The date of inauguration is to be set by a Presidential Decree. Citizens of Lostisland or represenatives of foreign countries willing to deliver their congratulation to His Excellency may email the text to election@lostisland.org and it will be published on this page. I’d like to attest my most sincere congratulations to Mr. Tezdzhan on the occasion of his election. I’m sure that his political experience would be of great benefit for the Federal Republic, and I wish him the very best of luck during his term as the Prime Minister. I am pleased to extend my heart felt congratulations to you, Excellency, on your victory in the just concluded Election for the position of Prime Minister of the Federal Republic of Lostisland. Congratulations! I want to formally congratulate our Prime Minister for his victory, the people have spoken, as a democrat I respect the people’s decision and will continue to serve the Republic in whatever matter I am able to. Democracy is something special and very fragile, still we listen to her and expect the her to guide us to the right path. May we continue towards the right path and towards a greater role as a nation and a leading micronational government. Even so, I am proud that I came in second place, regardless of the fact that I was a meager 18%. To me, it meant that my message spoke to some of you, and I hope that even though I was not elected PM, I am able to serve the citizens in different capacity. I gladly extend my warm congratulations to Prime Minister-elect Denis Tezdzhan on recent victory and my best wishes for your success as you prepare to shoulder the responsibilities given to you by the people.